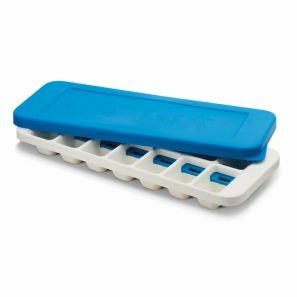 Joseph Joseph Quicksnap Plus Ice Cube Tray. Similar in style to a conventional ice tray, this innovative design has a unique switch mechanism, which holds the ice cubes securely in place until required. This new updated version includes a flexible lid that enables you to stack the trays on top of one another in the freezer drawer, helping to prevent water spills and the ice cubes from tainting with any freezer odours.